Hey party peeps! 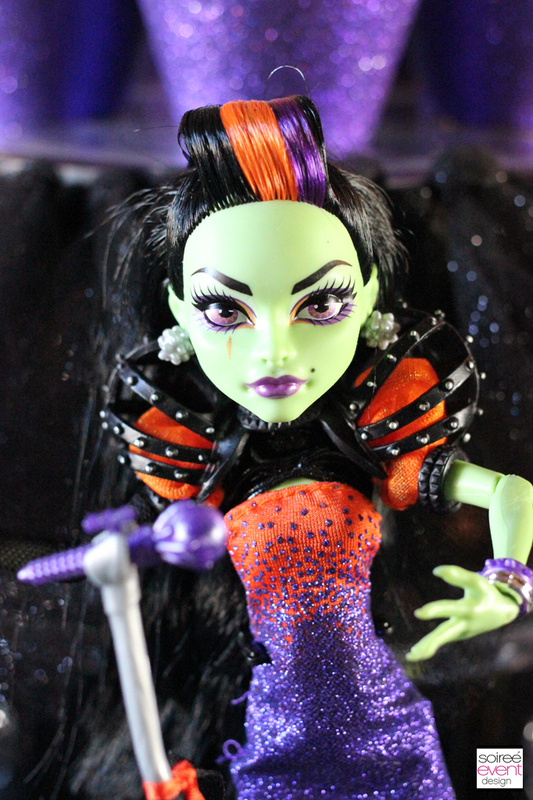 Today I am beyond excited and honored to be asked by Mattel to style a Monster High Party to debut their brand new Monster High Casta Fierce doll! 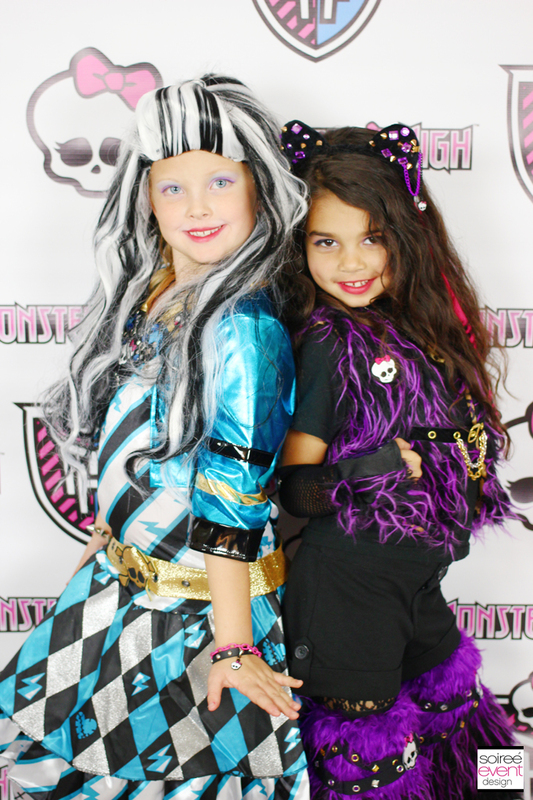 My girls are Monster High fans and I must admit, it is one of my favorite movies and webisodes to watch with them. 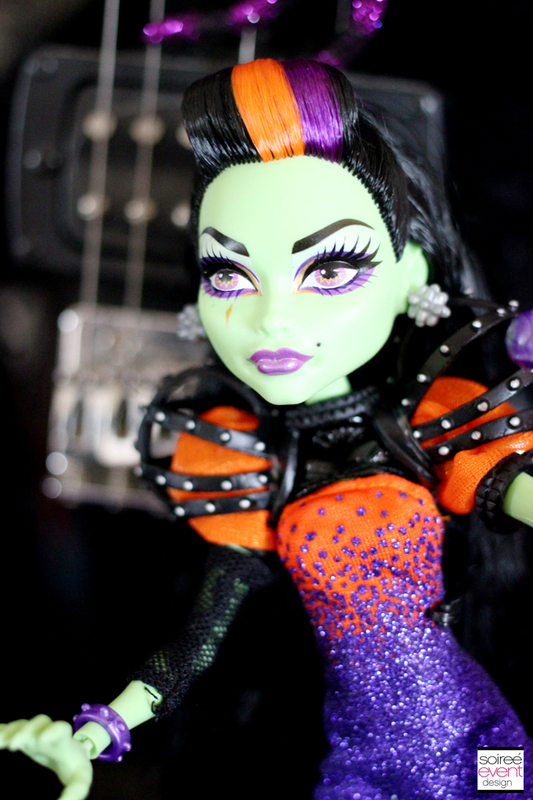 When Mattel first showed me the doll, Casta Fierce, I knew right away she was right up my alley–a rock star diva witch who LOVES glitter, leather and metal studs! My girls would LOVE her! 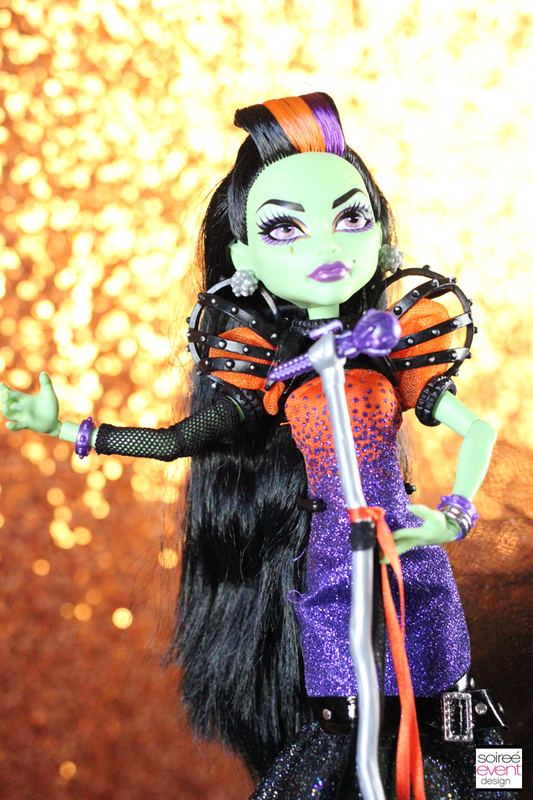 Casta Fierce and her band The Spells only perform once a year and this year, she’s coming to Monster High for her annual concert on Halloween night! 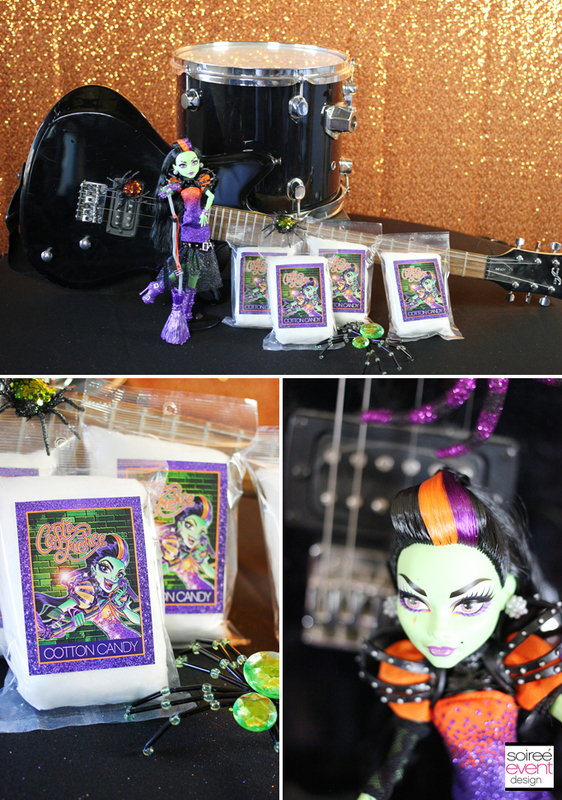 My girls and I have been watching the Casta Fierce webisodes leading up to her concert and invited a few of their friends over to celebrate and watch her concert where she will sing her popular song, “Witching Hour”. 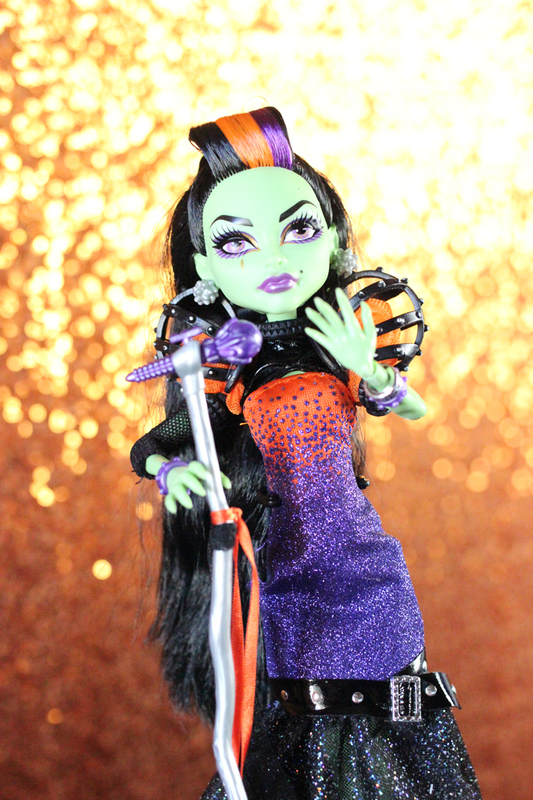 The girls of Monster High are all excited about her arrival and were given backstage passes to hang out with Casta Fierce before her concert. 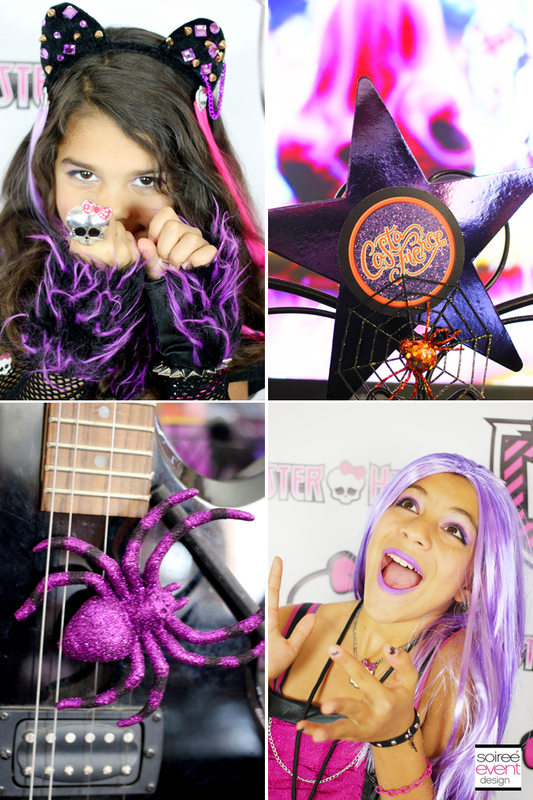 I decided to get the guests in on the action by feeling like they were part of the Casta Fierce concert experience by designing the party with a “Black Carpet” entrance, Monster High Dressing Room with makeovers and more! 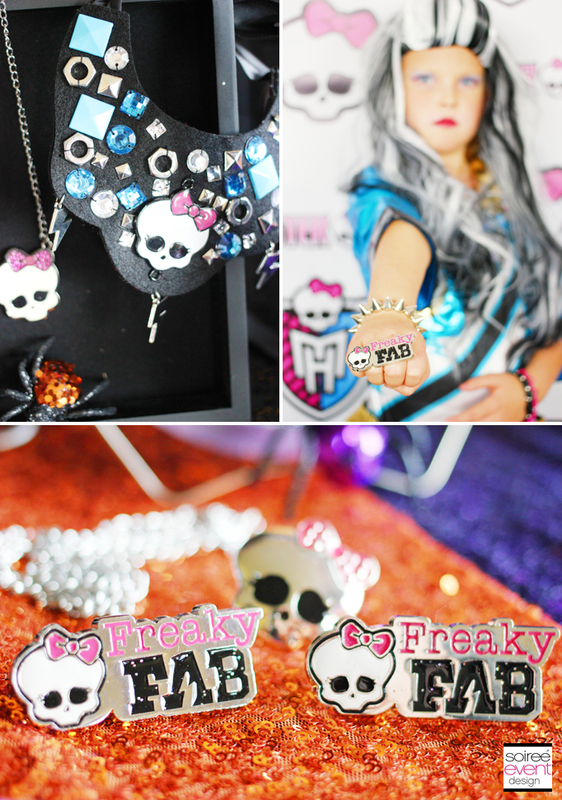 Check out the rest of the post where I share with you how you can pull off this party for your Monster High fans. 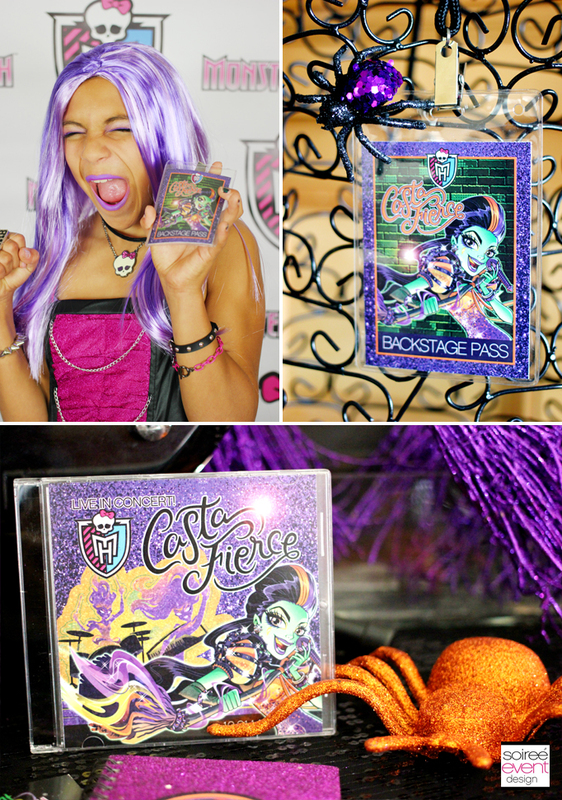 AND…be sure to scroll down to Enter to Win a Monster High Casta Fierce Party Pack! 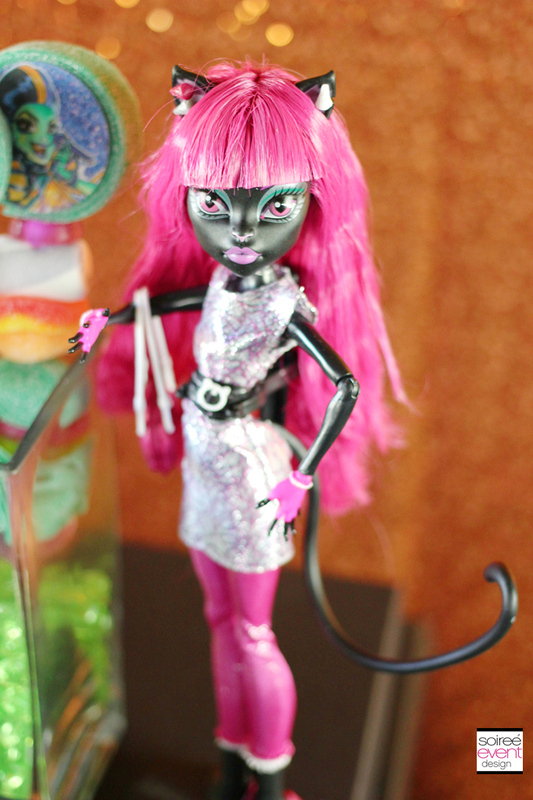 GIRLFRIEND TIP: When you have a small guest count like I did here, you could also give each guest a Casta Fierce doll as a take home party favor! The girls were beyond excited to take this diva home! GIRLFRIEND TIP: Playing music when guests arrive for your party is always a fun time. The guests dance around when they get inside and it just sets the tone for a fun time. Also, trust me when I say that playing music during photo shoots with guests also somehow gets the best poses! Try it…you’ll thank me! 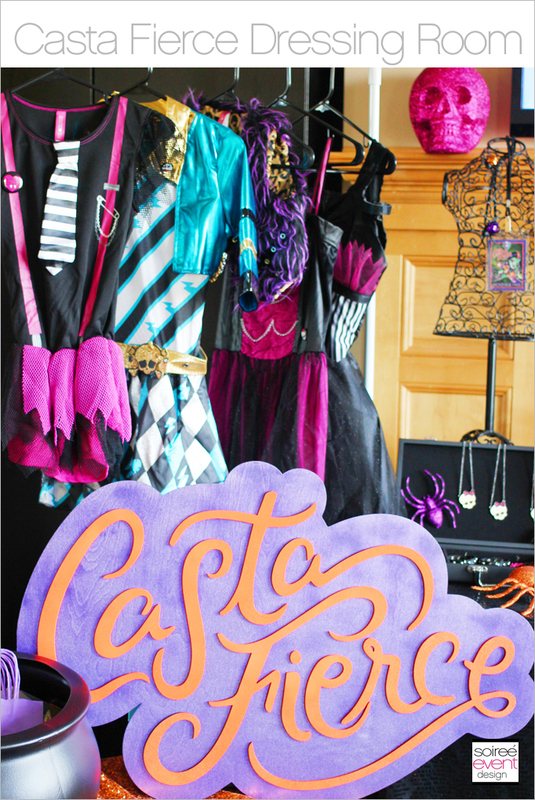 GET GLAMMED UP IN CASTA FIERCE’s DRESSING ROOM! 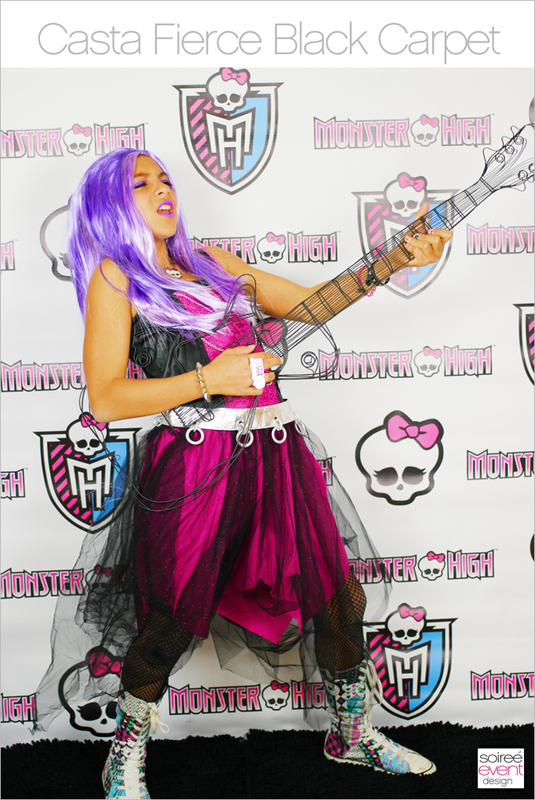 Casta Fierce Live in Concert at Monster High! 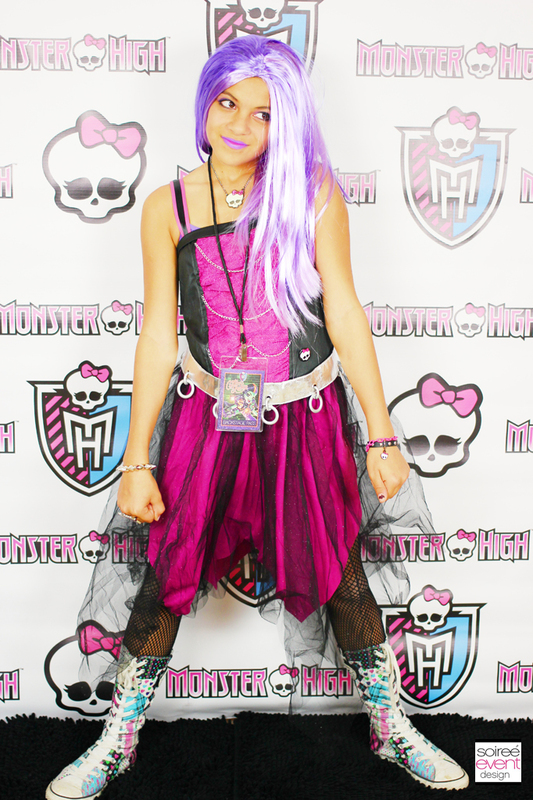 Each guest got dressed up in their favorite Monster High character’s costumes and accessories provided by Party City. They LOVED this. I even had a makeup artist come and do each girl’s makeup to match their costume. GIRLFRIEND TIP: When having makeovers at your party it is a must to have something for the kids to do while they are waiting their turn. 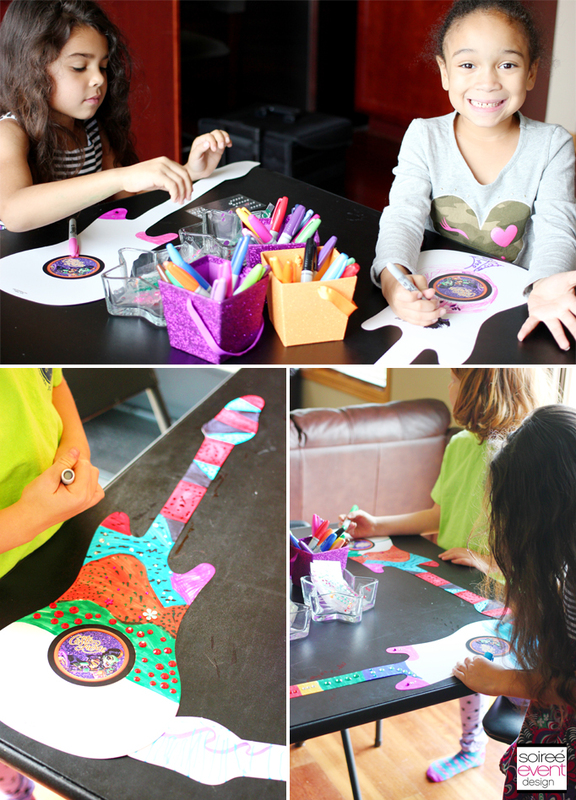 For this one, I customized these cool paper guitars with printable Casta Fierce labels and put out rhinestone stickers and bright colorful Sharpie markers and let the girls create their own rockin’ guitar! You could even use them as photo props when the girls are done. 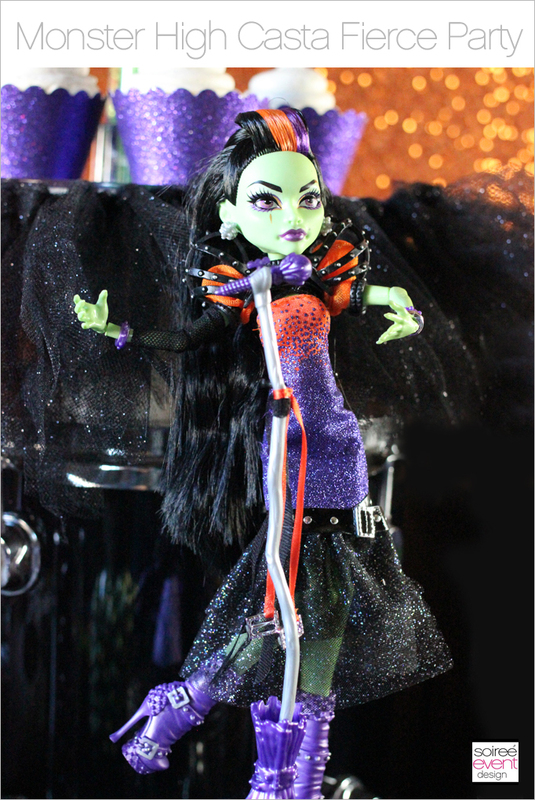 I also let the girls take turns playing Casta Bewitched by the Beat Sound Mixer, an interactive online activity where girls can play DJ & conjure up scary-cool remixes of Casta’s single “Witching Hour” and other Monster High hit songs. The game lets them save their versions and share with friends. WALK THE BLACK CARPET GHOUL-FRIENDS! 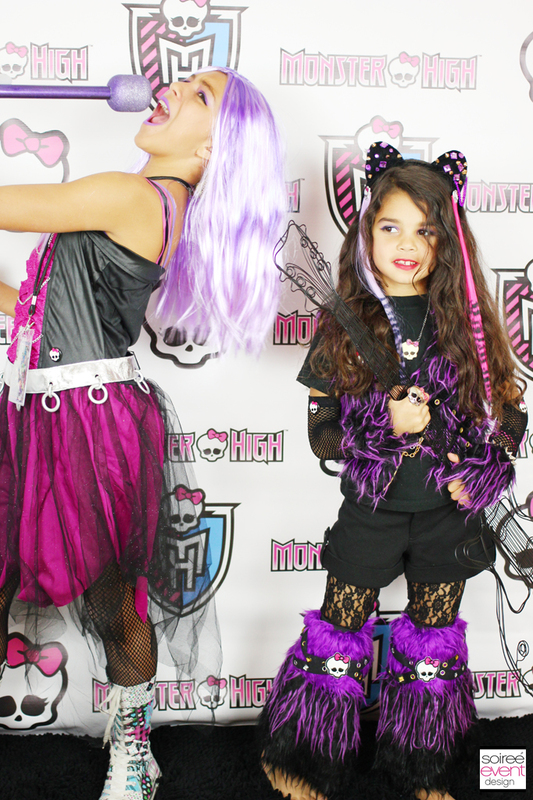 Once the girls were all dolled up I gave them their exclusive Casta Fierce Concert backstage passes and off they went to walk the “Black Carpet” and pose for paparazzi style photos in front of a custom designed Monster High step and repeat backdrop. If you have never done this before, you must do it at your next party! Girls getting dressed up in character and having a photo shoot is so hilarious to watch. The girls truly get into character, come out of their shells and easily strike a pose…or two…or three! I put out a few party props like this wire guitar which spawned MANY air guitar moves! 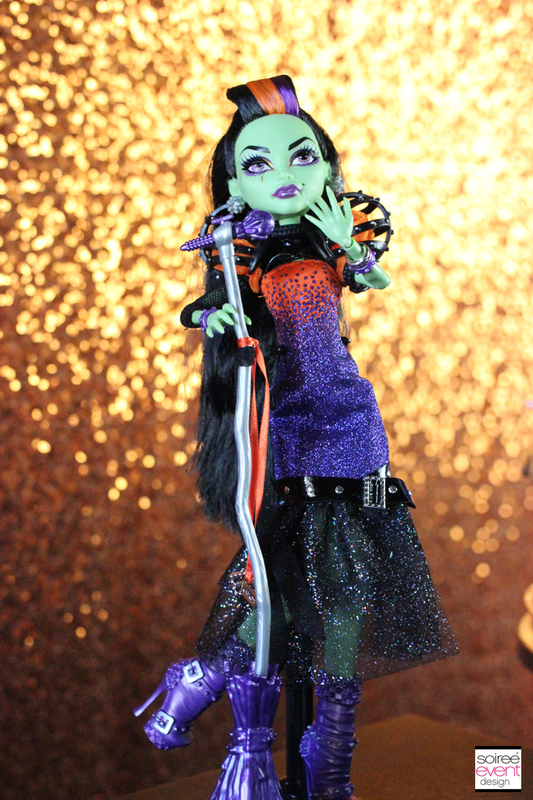 I also made my own Casta Fierce full size microphone stand from a plastic mic, broom handle and purple tutu. 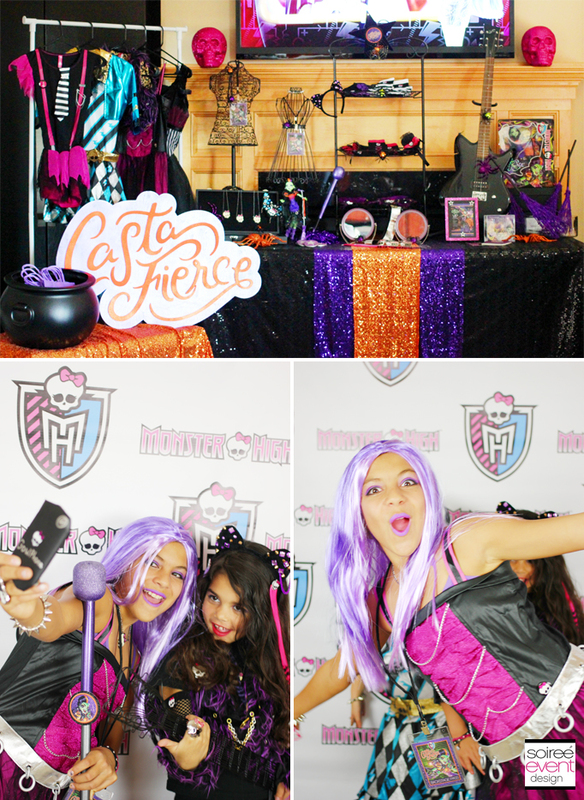 My oldest daughter, who dressed up as her favorite Monster High character, Spectra Vondergeist, even made her own “ghoul phone” to snap “Ghoul-friend Selfies” and she even managed a few photo bombs! What fun! GIRLFRIEND TIP: To create a “black carpet” experience, Mattel gave me permission to design this 6′ step and repeat banner exclusively for this party. That part was easy. The black carpet…not so easy to find…so I created my own by placing two 3′ furry black bath mats side by side to create my own 6′ black carpet! And the best thing…bath mats have a non-skid backing on them so they don’t slip around on your floor while the girls are posing for the camera. 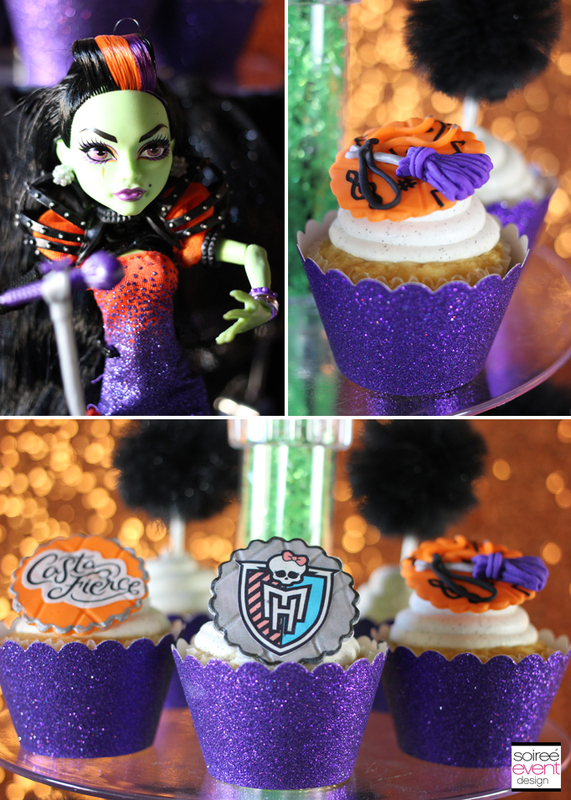 THE FINALE…END THE MONSTER HIGH CASTA FIERCE PARTY ON A SWEET NOTE! 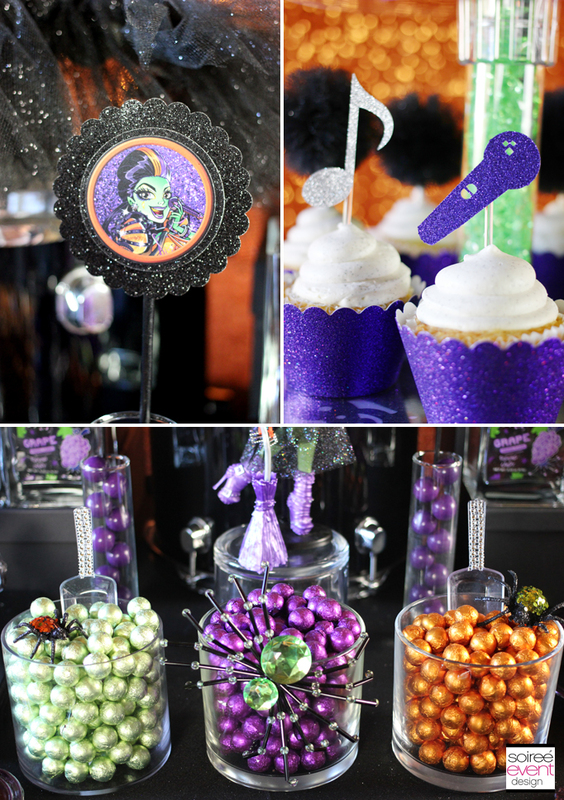 The wow factor decor moment for me is always the Candy Bar! I LOVE designing these for my clients and this one is no exception. 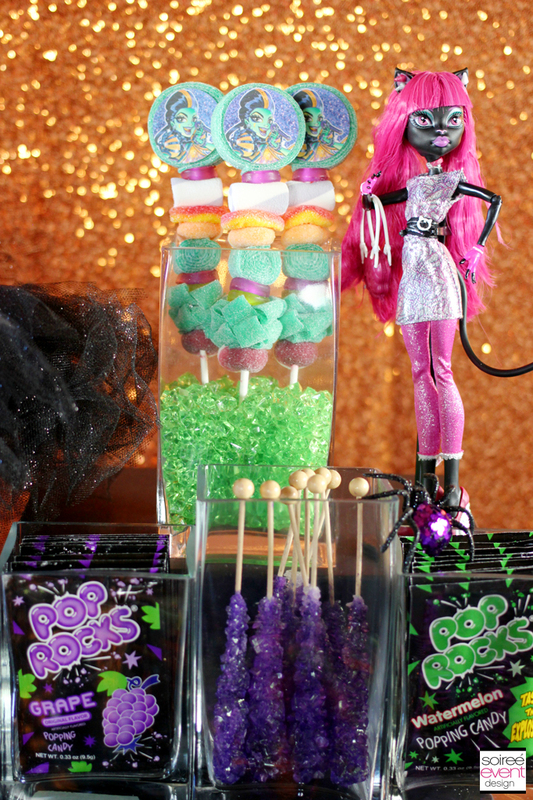 From real drums and guitars to sparkly black tulle, bright sparkly sequin and custom themed desserts, this candy table was designed perfectly to match Casta Fierce herself. The linen was the jumping off point. Not just any linen would do for a diva like Casta Fierce! I stared at the doll and AHA! I will make the table round and have it look like the bottom of Casta’s dress! How fabulous is this sparkly black tulle table skirt I had custom made to anchor the table. 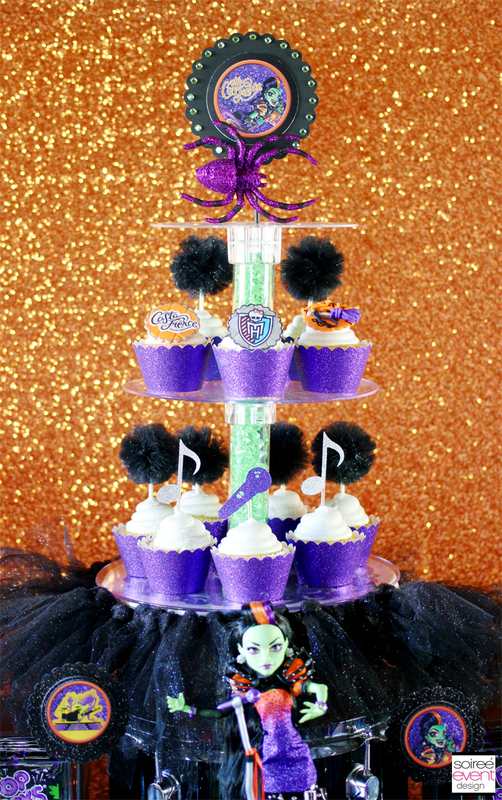 I also carried the black sparkly tulle into the table’s design with this gorgeous black tulle cake stand skirt that anchored the towering cupcake display with black tulle pom cupcake toppers, sparkly microphone and music note cupcake toppers and themed fondant toppers sitting on top of glittered wrapped cupcakes. 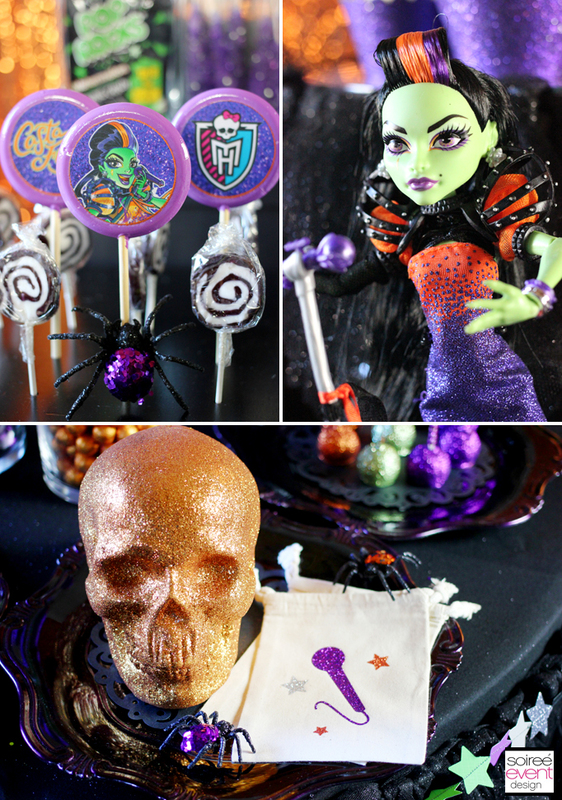 The purple, green and orange colors of the Casta Fierce doll were carried through in all of the custom desserts and candy. 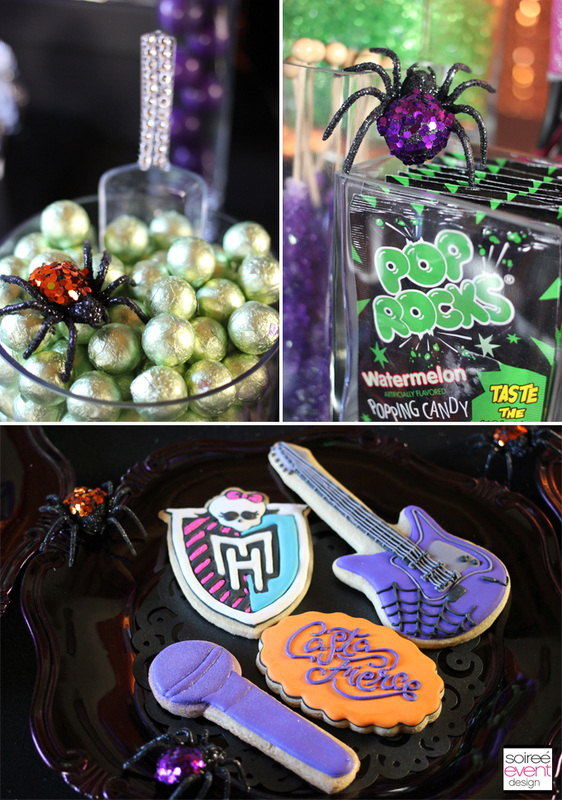 In keeping with the rock star theme, I filled the table with Pop Rocks, rock candy (which I also used as cupcake toppings), microphone topped chocolate covered oreos, glittery cake pops, sparkly mini donuts, a custom collection of Casta Fierce iced cookies, candy kabobs and LolliPics custom printed lollipops! 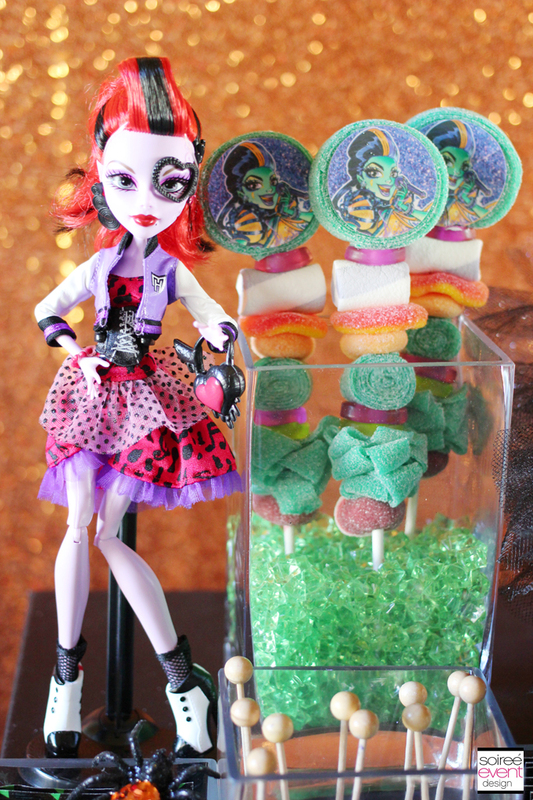 Custom labeled cotton candy and a potion drink bar finish out this Monster High Casta Fierce Party. 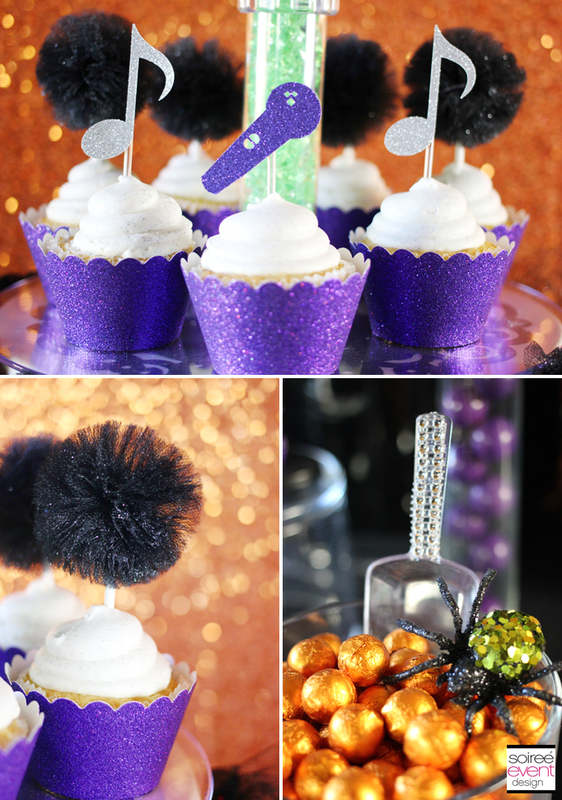 GIRLFRIEND TIP: This party would also be perfect for your upcoming Halloween parties! 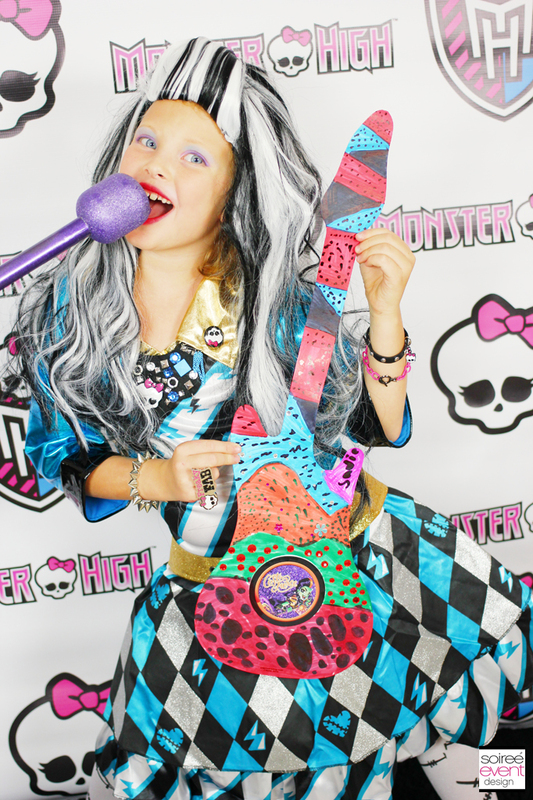 Imagine rockin’ out with a Monster High Casta Fierce Party on Halloween night before heading out for a night of trick-or-treating! 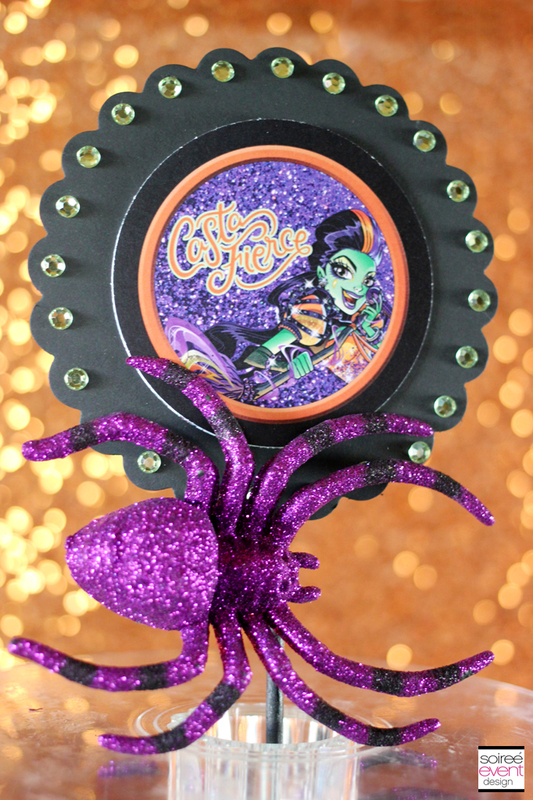 CLICK HERE to check out my Day of the Dead Pinterest board for a virtual shopping list of most of the items I used in this party’s design along with prices and links to purchase them. 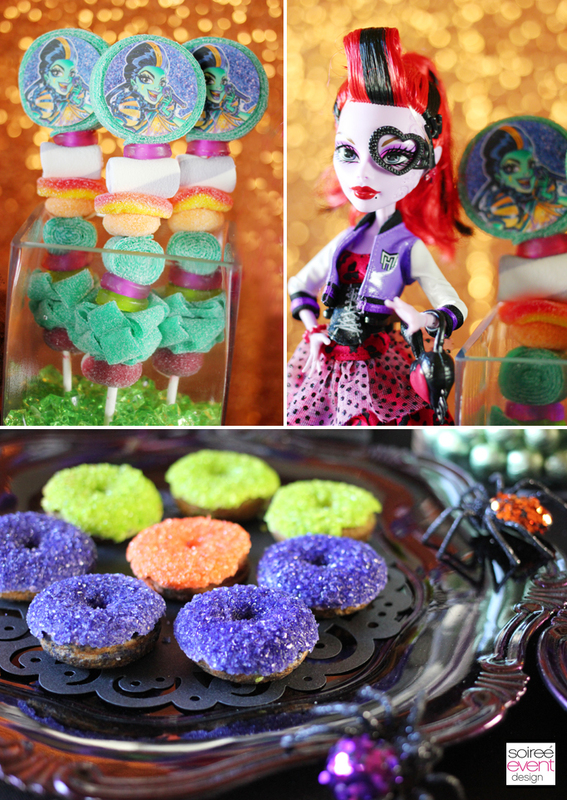 Follow Soiree Event Design’s board Day of the dead party on Pinterest. 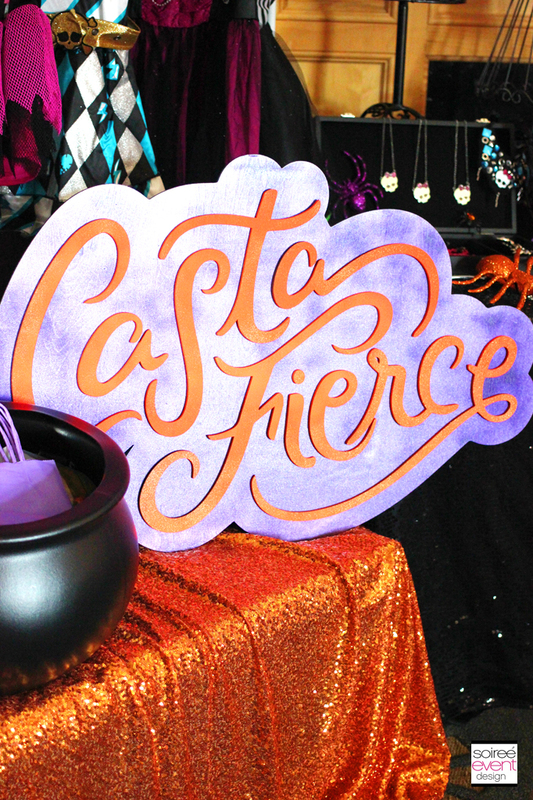 ENTER TO WIN A CASTA FIERCE PARTY PACK! THE GIVEAWAY HAS ENDED. Giveaway will run for one week, ending on 10/29. Winner will be announced on 10/30. The winner of the package will need to provide a 4 week advance notice of their party to ensure all the vendors of perishable items will have time to make and ship you the personalized items. The winner will have up to one year to redeem their prize. Good luck! everything looks so amazing! Congrats on all your hard work! That is such a fun party idea for young ladies!! Those costumes are awesome! What a fun party! Great job! 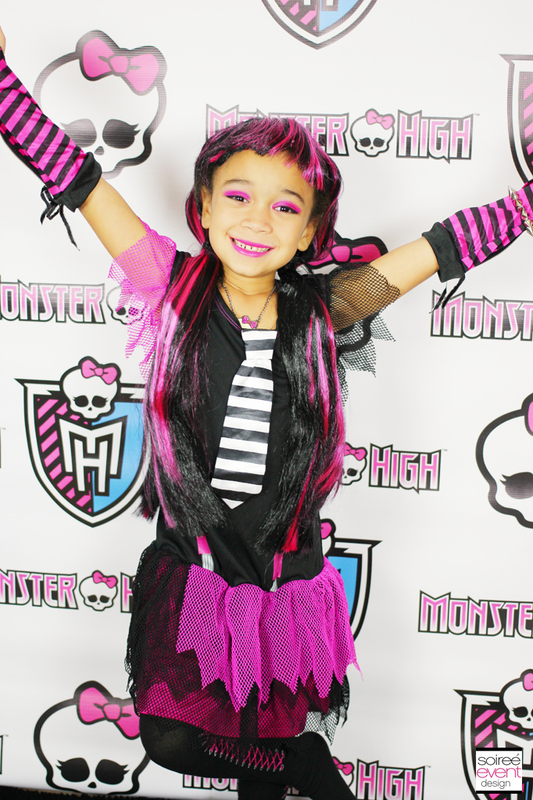 This party looks like any Monster High fans dream! I know my daughter would of had a blast in Casta’s dressing room! Great job! Congratulations on this project you did an amazing job. Everything looks fabulous! This is so fun! And such a great giveaway! I absolutely love this party. 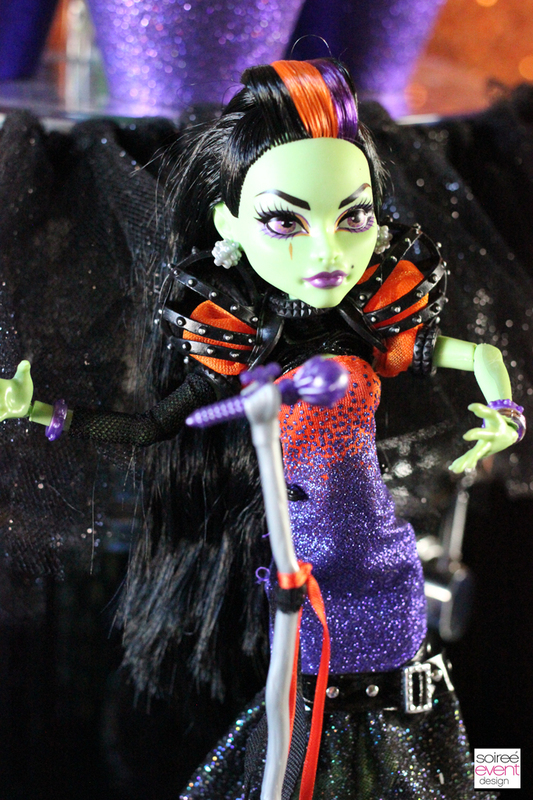 The dolls and dress up costumes are great. Awesome idea to create a guitar. Great job! You did an AWESOME job! Congratulations on this. 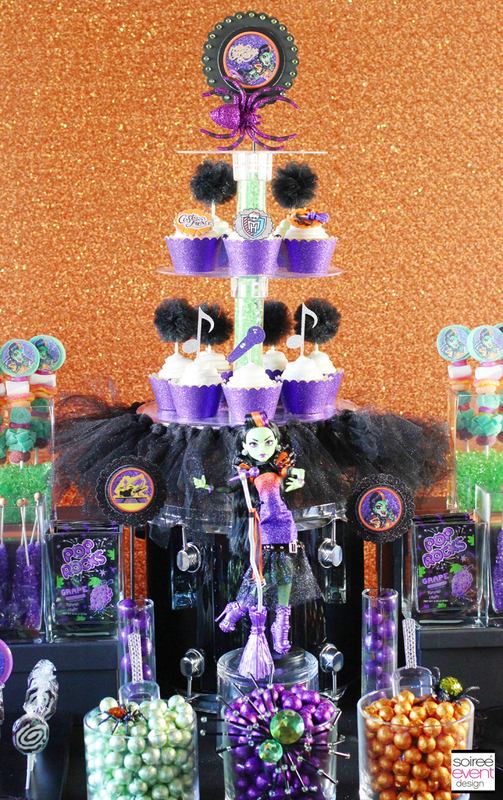 I have a couple nieces who would go nuts over a party like this! Looks like a lot of fun! OMG so much FUN! Love your ideas and DIY tips and tricks! You did an awesome job!!! It was detailed to the T. Congrats!!! What a fun party setup. 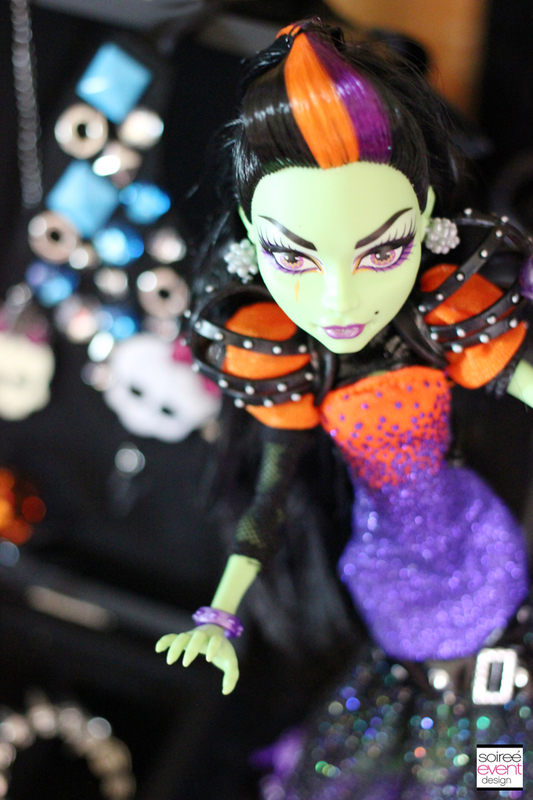 I love all the colors and the dolls. The costumes are GREAT! Looks like everyone had a blast and the costumes were amazeballs! The decorations were awesome too. Wow what an awesome party! My daughter would love this! What a amazing party, Isa would love this for her next birthday. Entered to win! If i had a person in my family that I could throw this party I would enter, what a great set up. This party is beyond FABULOUS I mean everything is so fierce and those costumes ROCK. I love it all those doll is so cute. The kids did some amazing poses they look like they had a blast. 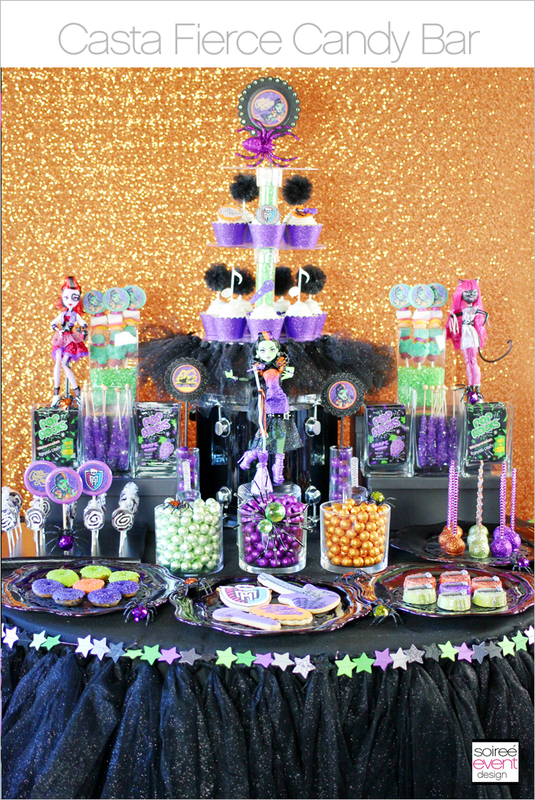 The Candy table is beautiful. Just love every detail. This party design is so so awesome. I absolutely love what you’ve done. Jadyn would enjoy a party like this. Great Job Tonya! Those are quite some dolls. I like the colors of their clothing. 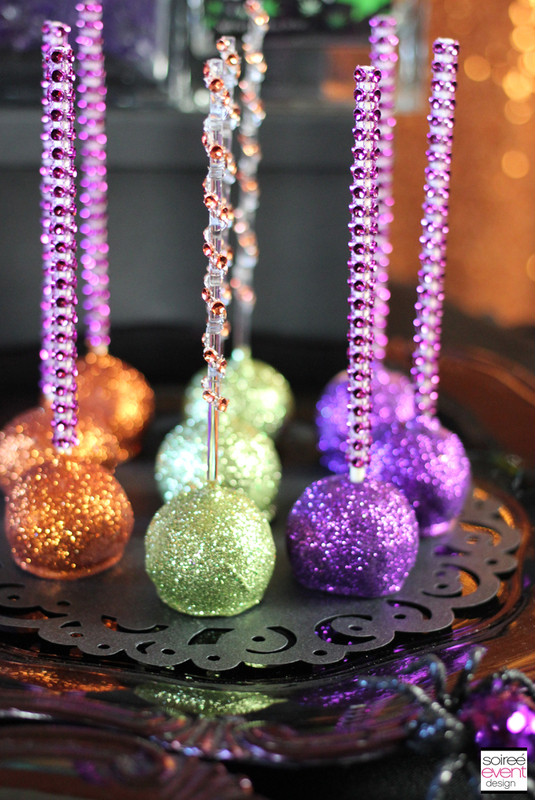 Love this party idea so fun and colorful. 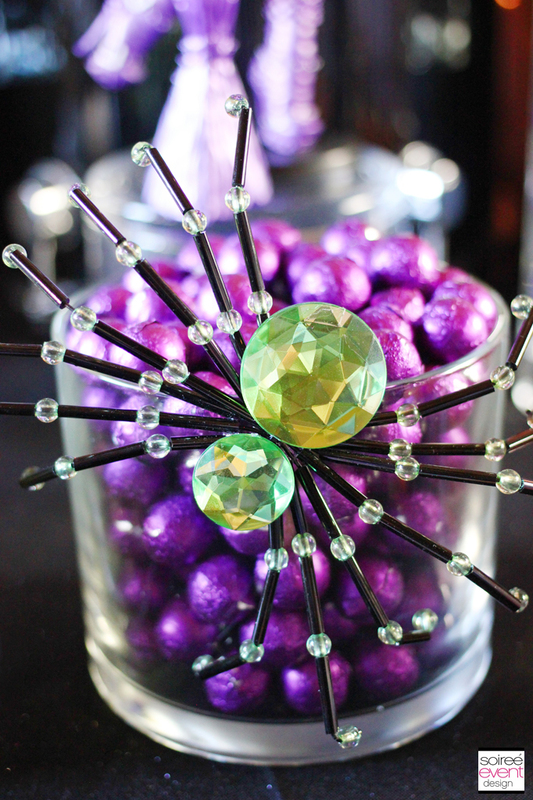 It must be a blast to design a party around the details. They have so many interesting details to capitalize on! This is so cute. I bet it was so much fun. There is so much attention to detail here. It is really incredible. i am so impressed with how beautiful everything is here! Looks like a celebrity status kids party! Love it so much! 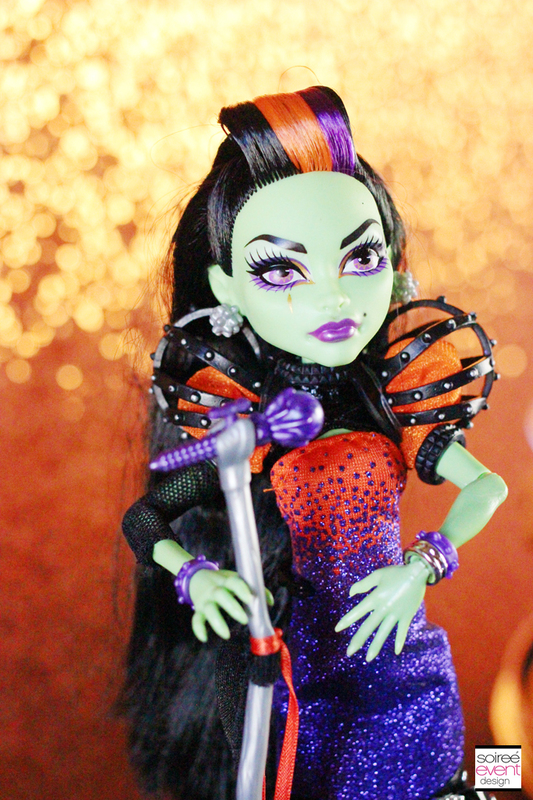 I love how all the girls were monster high fierce! The party looks incredible! Super cool stuff! 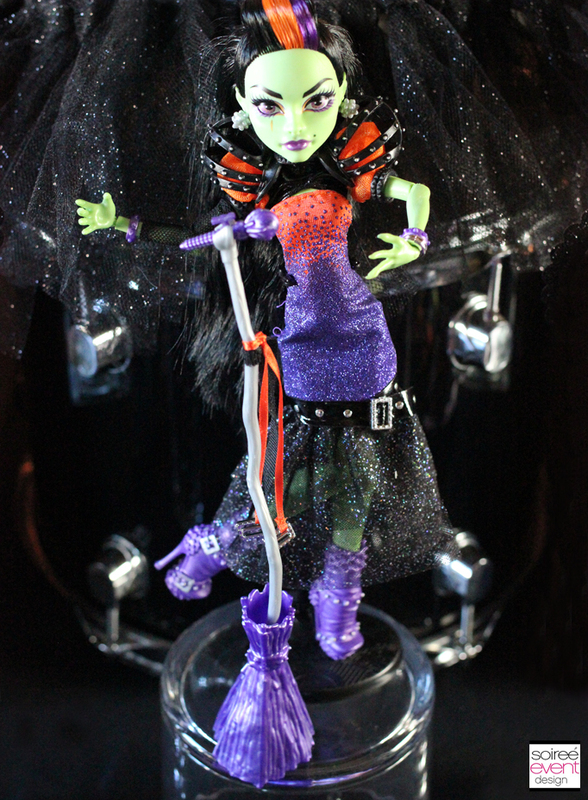 My neighbor LOVES Monster High Dolls. Great theme! My daughter is just starting to get into dolls so this could be really great for her! Loved this party theme and you have the most beautiful Daughters! What fun makes me want one myself now! Can’t wait to share this! I was just looking at these with my daughter. She really wants some of these dolls! 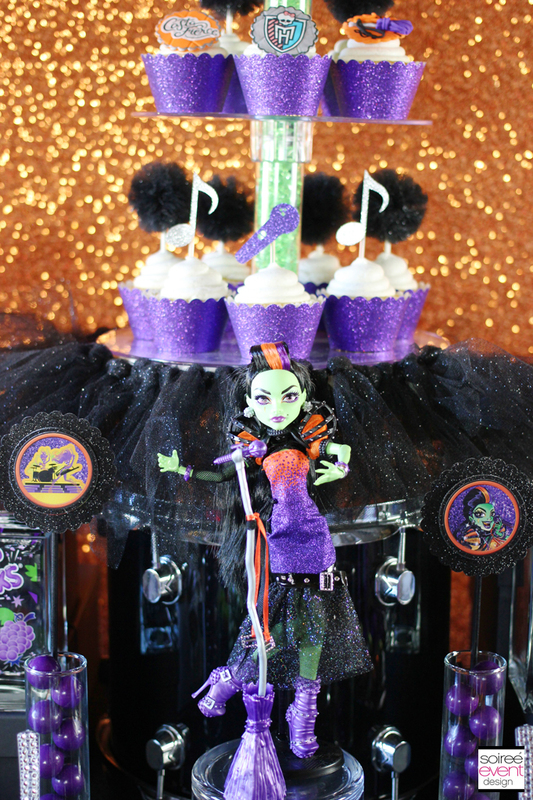 Such an awesome party – little girls would love this! Wow! This is really awesome! My friends like this because their daughters do! These are really great! Love looking at all the pics! Perfect as always! I love the color scheme! 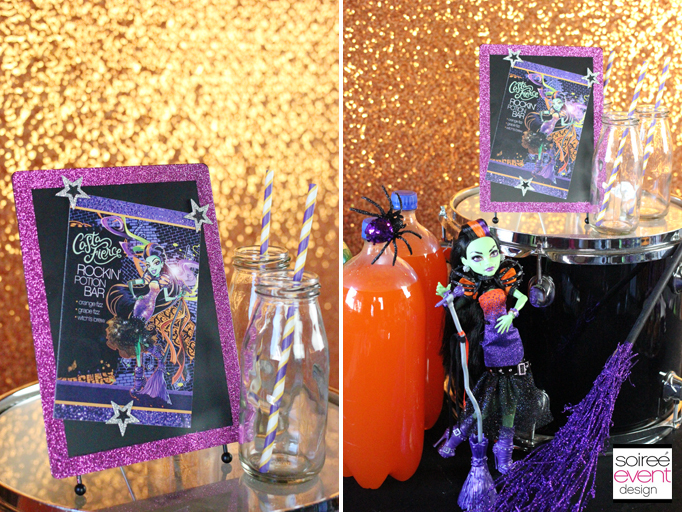 I am using that scheme this weekend for a Halloween party! SO very cool. 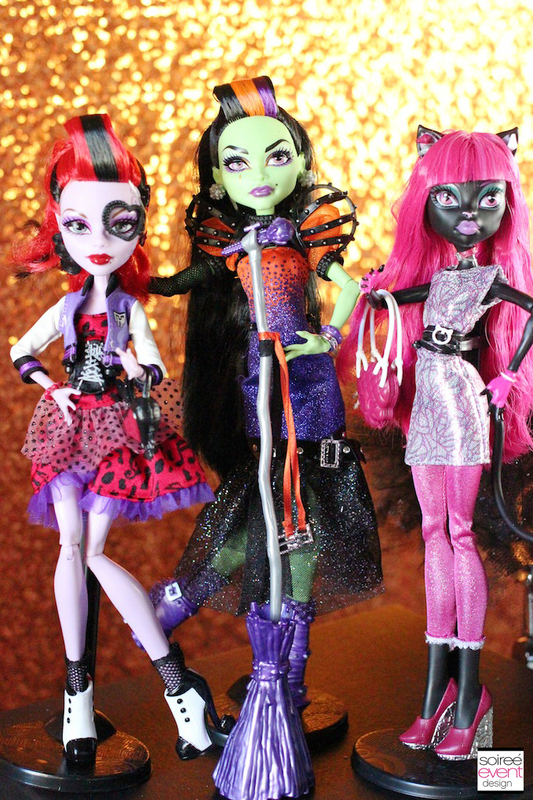 My daughter loves Monster High and these girls look like they are having a ton of fun. Always LOVE your work! Your parties are so fun and colorful! Great job! I love the step and repeat banner!! Where can I purchase one? I would love to have one similar for my daughter’s bday.